The Mission Impossible franchise gets its fourth director in four films making for an all new feel while maintaining levels of action that could make a grown man SQUEE! Brad Bird of The Incredibles, Ratatouille and Iron Giant fame takes the helm in the holiday seasons biggest blockbuster which hits cinemas and IMAX on December 15th. The different feeling of this film is most obviously attributed to the change in director. Bird's film is somewhat less deep and focuses more on fluidity than the previous outing. This is a fantastic "popcorn" movie. Often the term "popcorn movie" is used in the negative but realistically, they have their place and Mission Impossible: Ghost Protocol does a great job. Of course, the gadgetry is as ludicrous as it is impressive. The tools used by Hunt and his crew are so far fetched yet downright fun. The action sequences are as incredible as they are ludicrous. Bird shows a deft hand at action sequences by giving a sense of impact to every shot. Nobody ever seems to get seriously injured but each punch, kick and crash looks like it hurts. Ghost Protocol easily pulls together the best ensemble cast of the franchise with Tom Cruise reprising their roles as Ethan Hunt and Benji Dunn respectively. Now, its no secret that Tom Cruise has had his detractors (for reasons which are none of our damn business in my opinion) but in this film, he IS Ethan Hunt. I'm a fan of Mr Cruise in general, his body of work is among the most solid that you would find and in Mission Impossible, he owns. There isn't much to say about Simon Pegg without gushing. He is without a doubt one of today's greatest comedic actors but in his role as Benji, we see a glimpse of even further potential. Gone are the days of flailing about with a cricket bat in Shaun of the Dead, Pegg looks so comfortable with a firearm that more action films are inevitable. Further strengthening the cast are Jeremy Renner as William Brandt and the gorgeous Paula Patton as Agent Jane Carter. Patton especially excelled in the role as a type of black widow, beautiful but deadly in so many ways. The screening that I watched was at IMAX and I have to say, I was a little disappointed. The film itself was spectacular but the IMAX screen was so damn big that it wouldn't all fit within my peripheral vision. During action scenes it almost felt as though I was at a tennis match trying to catch as much of every car crash and firefight as possible. The upside to this was that landscape shots of Russia, Dubai and India were glorious. I wouldn't say not to go to IMAX because it was certainly impressive, but if you decide to opt for the gigantic screen sit in the back row. Mission Impossible: Ghost Protocol is exactly the shot in the arm that the franchise required. MI:III certainly wasn't a bad film but it did feel as though it the MI series was winding down. After watching Ghost Protocol I can't imagine that this will be the end and personally, I hope there are still a couple more in the tank. Who knows, maybe we will see an MI where Hunt steps aside allowing Dunn to take point. 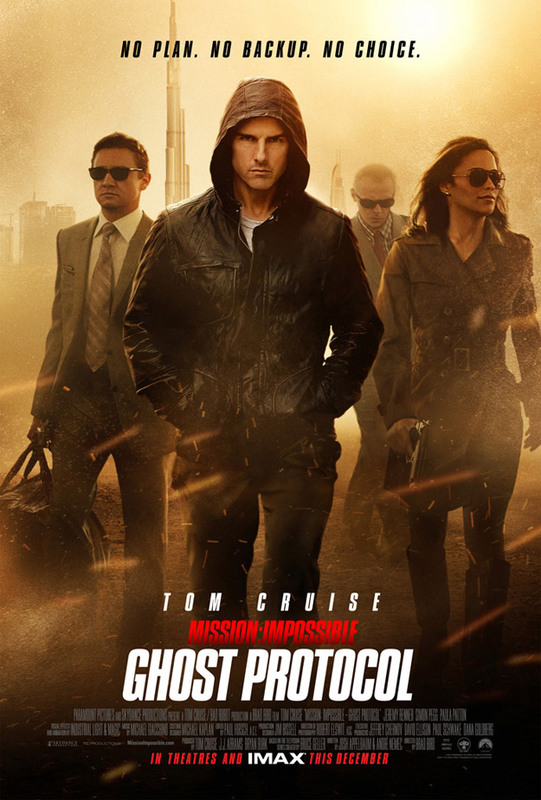 Mission Impossible: Ghost Protocol is in cinemas and IMAX from December 15th.